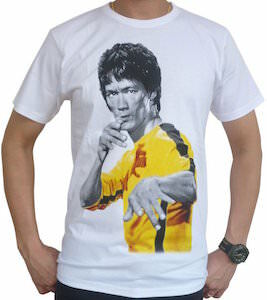 Now you can have a Bruce Lee t-shirt that is just cool. The white t-shirt shows a black and white image of Bruce Lee but it’s not all black and white as the shirt Bruce Lee is wearing is yellow and that makes this t-shirt stand out nicely. It’s a great look that maybe a bit different but hey so was Bruce Lee in his days. You can get this t-shirt in many men’s sizes and all are made from 100% cotton for that perfect fit and feel. Show the world you love of the work of Bruce Lee by wearing this special t-shirt. The martial arts king, the red dragon, the list goes on for nicknames of the awesome Bruce Lee. 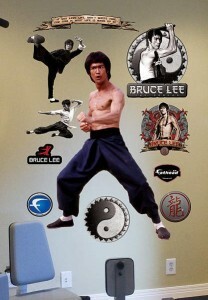 Changing martial arts movies for ever Bruce Lee is an icon, this is a set of wall decals that feature one large size decal of Bruce Lee in a power stance along with 10 other smaller decals like a yin and yang, a black suited karate kick Bruce Lee, a red dragon Bruce Lee and more. Made to be very easy to put on with a simple peel and stick method, when it is time to take them down they will not leave a sticky residue mess. Bruce Lee the master of martial arts feared by everyone, it is time to pay respect and show your a fan with a huge kick to the face with Bruce Lee’s deadly side kick. On the front of this shirt Bruce Lee is giving his best side kick with his foot looking like it is jumping right out of the t-shirt, and of course Bruce is dressed in a classic black martial arts suit. The Bruce Lee t-shirt is available in sizes that range from Small to XL and it is made from 100% cotton which will make this a very comfortable shirt but also be super durable to last you a long time. Hi-yaa! Take that you bad guys. No one can stand up to the world’s greatest Martial Artist, Bruce Lee. Why not channel your Bruce Lee powers with a cool t-shirt? 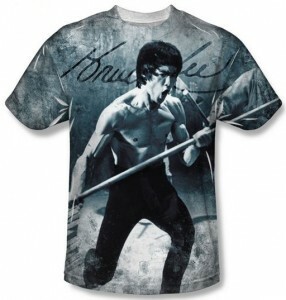 This t-shirt is black and white and features Bruce Lee in a ready stance with a wooden staff ready to take the next opponent on. In the background is his signature. The sizes for this scoop neck t-shirt are Adult and Youth sizes. This way the Bruce Lee fan in your family can have the right fitting t-shirt to practice their moves in. 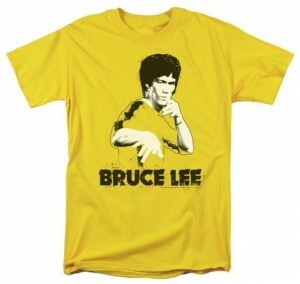 Get your Bruce Lee t-shirt today and say “Whoooaaa”. He is perhaps one of the most influential martial artists, instructor, actor and film maker of his time in America and even the world. Bruce Lee is best known for “Enter the Dragon” in 1973. This t-shirt features Bruce Lee in a karate pose and “Bruce Lee” in capital letters underneath the picture. It is so simple, but makes for a great conversation piece as you walk down the street. It comes in Adult, Youth, Juvenile and Toddler sizes and is 100% cotton for all of your family to enjoy. Get the Bruce Lee Splatter t-shirt and celebrate his life and his mastery of martial arts.